The specifications and platform details for Intel’s Skylake processors have been leaked by Sweclockers only a day after the launch of the high-performance Devil’s Canyon processors. Its become a norm that whenever an Intel launch takes place, it is followed by a leak of the upcoming generation of processors as it has been happening for a few years now. Last time during Haswell’s launch, Broadwell details were leaked on the web instantly and the same has happened today. There are a handful of details which were previously confirmed such as Intel Skylake processors featuring support on 100-Series chipset and will feature socketed design. The most interesting rumor came up last week which was regarding the co-existence of both Broadwell and Skylake processors in the year 2015. While Intel launched their 22nm Haswell processors last year (Tock), they were supposed to introduce Broadwell early this year however due to issues in 14nm production, the launch was halted till late 2014. Hence, this year, we have only seen an updated Haswell lineup in the form of the Haswell Refresh along with the 9-Series chipset platform. The 9-Series chipset was prepared specifically for Broadwell but due to launch delays, Intel tried into convincing their desktop users with new Refresh and the Devil’s Canyon processors. With first round of Broadwell chips aimed towards mobility platforms such as AIOs, Ultrabooks, Notebooks, etc, Intel would release their Broadwell socketed processors not until Q1 or even Q2 2015. This only means that the Broadwell launch has been disrupted by the initial 14nm production delays but Intel’s roadmap still sticks to its core plans with Skylake launching in 2H 2015. 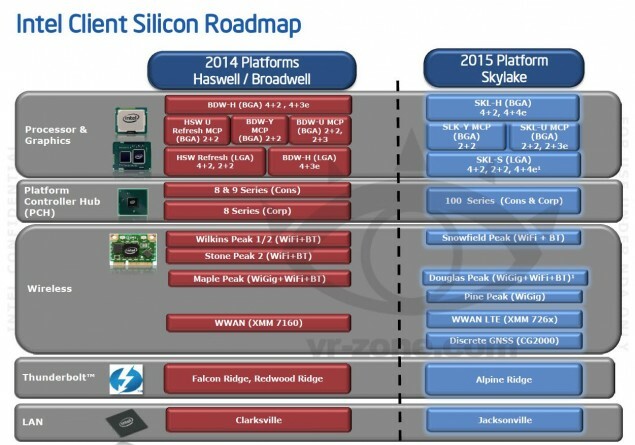 The Co-existence of both Broadwell and Skylake processors in 2015 will sound a bit weird since it will create confusion on consumers end for whom it’ll be hard to decide between the new platforms. According to the source, the Skylake processors would be compatible with the latest LGA 1151 socketed boards and Z170 chipset which is part of the new 100-Series chipset replacing the 9-Series “Wild Cat” PCH. The second most interesting thing covered is that Skylake processors would have both DDR3 and DDR4 memory controllers so they will support both types of memory. We showed you several enthusiast grade DDR4 memory yesterday from various companies, ADATA, Corsair, Crucial to name a few. However, the initial cost of the DDR4 memory while suitable for the HEDT Haswell-E platform won’t be that good for the mainstream Z170 platform hence users will have the choice to stick with cheaper DDR3 sticks till DDR4 prices fall down or upgrade if they have the cash to afford a DDR4 memory kit on the mainstream platform. The reports also mention that while Broadwell and Skylake processors would launch aside each other, the first Broadwell LGA processors will have an unlocked K-Series design along with Iris Pro graphics while the initial Skylake processors would be entry to mainstream chips with the unlocked parts arriving later on. Now these are interesting considering that Skylake will feature GT4e graphics in addition to support for DDR4 memory. Intel Skylake processors will boast a totally new architecture considering they are a Tock when it comes to the Intel Tick-Tock model. The GT4e graphics will feature graphics improvement with more execution units compared to Broadwell which from leaked details is said to mention 48 EUs on GT3e and 24 EUs on GT2 level processors. Broadwell will also be the first processor to introduce GT3e graphics with on-die eDRAM cache on desktop level. Haswell refresh series will also come in different variants such as H/Y/U/S series but will not have many improvements since its based on the same Haswell architecture which launched last year. The most notable thing is that Intel will actually feature support for DDR3 memory on the Y and U series Skylake chips while the others including desktop processors will support DDR4 memory as confirmed several times before. We will also get several new Wireless technology on the 100-Series chipset such as Snowfield Peak (WiFi + Blue-tooth) replacing Wilkins Peak, Douglas Peak (WiGig+ WiFi + BT) replacing Stone Peak and Maple Peak and the Pine Peak plus WWAN LTE chips (XMM 726x) replacing the WWAN XMM7160) for wireless connectivity. Intel is also introducing the latest Alpine Ridge thunderbolt controller with Skylake pushing speeds of 40Gb/s, double that of last generation. For LAN, Intel will introduce Jacksonville to replace Clarksville.